Volant Air Filter Cleaning Kit5Robert MohrmanOctober 19, 2014Simple to use Arrived in a few days. Thing to remember is don't use too much oil. Volant Air Filter Cleaning Kit5TroyApril 3, 2010Apply cleaner and clean. Oil when you are done and put filter back in car. Not much to review or say... It does what it does and does it properly if thats what you are asking. Volant Air Filter Cleaning Kit52010 Ford F150April 1, 2010Kit arrived to me 3 days after I ordered it which was nice. Cleaning solution and oil are both included so it was everything you need. The only thing I would say is the instructions could be a little more clear for people to be care not to put too much oil on the filter after they clean it. If oil is running or dripping off the filter you put too much on and need to take some off. The kit has enough oil in it to do probably 4 cleanings. The Volant Air Filter Cleaning Kit is specially created to ensure your Volant air filter and intake system are performing at their peak levels. While protecting and enhancing your engine�s performance, the Volant Air Filter traps gobs of dust, dirt and debris. About every 10,000 miles, you�ll want to oil the air filter with the Volant filter oil, and after 30,000-50,000 miles, under normal driving conditions, you�ll need to clean it with the Volant cleaning solution and then re-oil. 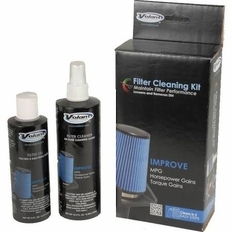 The Volant Air Filter Cleaning Kit comes with both the filter cleaning solution and the filter oil. The cleaning solution is specially formulated, so it won�t damage the filter medium. The performance oil is a breeze to apply and features a blue tinted dye, so it�s easy to see where the oil has saturated the filter. The Volant Air Filter Cleaning Kit will typically yield 3 thorough cleanings. The part number for this cleaning kit is 5100 (blue filters) or 5110 (red filters). Cleaning your Volant air filter is easy. Just follow the steps below and you're Volant air filter will be clean in no time! Step 1. APPLY CLEANER: Spray Volant Air Filter Cleaner onto entire surface area of the Volant air filter until it completely saturates the pleated material. Allow Volant Filter Cleaner to soak into the pleats of the air filter for 10 minutes to loosen the dirt. Do not let cleaner dry on air filter. Step 2. RINSE: Rinse off air filter with cool low-pressure water. Allow gravity to flush dirt out of air filter by applying water to the clean side (inside) of the filter; up and down the length of the pleats. Continue to rinse the filter until all traces of cleaner are gone. If the filter is extremely dirty it may be necessary to repeat steps 1 and If there are spots of dirt remaining on the filter, spray each spot directly with cleaner, allow a few minutes for it to soak and repeat rinsing step. Step 3. DRY: After rinsing, gently shake off excess water and allow filter to dry naturally. Do not proceed to the oiling step until the filter is completely dry. Step 4. OILING: Apply Volant Air Filter Oil liberally to the dirty side (outside) of the filter only. This will allow for a visual reference of complete coverage. A. If using a squeeze bottle, squeeze bead of oil along the crown of each pleat using the lip on the squeeze bottle tip as a guide. If using a aerosol spray, spray an even amount of oil along the crown of each pleat. Wait 20 minutes for the oil to be absorbed into the filter media. Inspect the clean side of the filter for any areas that are lighter in color. Touch up these areas in the media by applying oil to the dirty side of the filter. Continue oiling procedure until there is an even red (or blue if your filter is blue) color over the entire surface of the clean and dirty side of filter. BE SURE NOT TO OVEROIL THE FILTER. The filter should not be soaked or dripping. Over oiling your filter can cause your mass air flow sensor to foul and turn on your check engine light. Step 5. FILTER INSTALLATION: Before reinstalling filter back into vehicle, inspect it for damage. Also be careful to fully tighten and seal your Volant air filter so it cannot come off or allow unfiltered air into the system. Your Volant air filter is now oiled and ready for use. Enjoy!